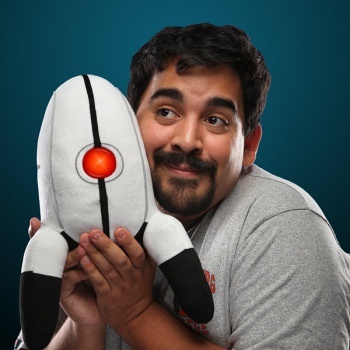 Just in time for the holidays, Thinkgeek is rolling out a line of official Portal 2 plush turrets that do everything except gun people down. Set to debut on December 18, the $30 plush is a little over a foot tall, has a glowing red eye on the front of its fuzzy carapace and reacts to external stimuli with the sort of Portal-appropriate quotes a fan might expect. Notice that I said "reacts to external stimuli," instead of "says." This isn't one of those dolls that you squeeze to hear a litany of pre-recorded pabulum. Instead, the plush turret responds to things much as its virtual analogue would. Knock it over and it might say, "I don't hate you." Move your hand in front of its motion sensor and the plush will reply with, "There you are." Ignore it and the clingy machine would sadly quip, "Target lost." Being a heterosexual male stereotype, I was raised to shun things like plush dolls and outward displays of emotion in favor of wrestling bears and punching commies, but this turret has just the right combination of fan service and adorable functionality to break through my hardened shell of Viking-esque masculinity. I want one. Actually, scratch that; I want to fill my room with dozens so I can take a Scrooge McDuckian dive into the middle of a plush ocean. As I lie there, squealing with glee (and brain trauma because I smashed my head against the ground), my plush pals will serenade me with friendly words that would otherwise precede a hail of gunfire. When the bullets fail to arrive, we snuggle. Despite its appearance as some kind of Dadaist attempt at official endorsement, the above is not at all a for-profit attempt at pushing your cash toward these things. I just really like them is all. So, with that disclosure out of the way, you ought to nab one of these turrets before they sell out. A full rundown of the plush's capabilities can be found on the Thinkgeek website, and if any of you would would like to send me one or fourteen of these fuzzy lil' dudes, I won't complain.